You know, this eating vegetables thing isn’t so bad. I’ve discovered that bean sprouts are pretty awesome, I’ve learnt that salad needs some kind of dressing or it’s not going in my mouth, and I’ve discovered that mushrooms sort of taste like meat if you pretend really hard. But seriously, except for my slightly dried-out sprouts, it’s been a lot easier than I imagined. I knew that I was gonna need something to match the strong flavour in the greens, so I went with a fillet of smoked haddock to bolster the flavours and keep things relatively balanced. Place the fish on a piece of tin foil and grind/sprinkle with some chilli flakes, drizzle a tablespoon of white wine vinegar ontop and wrap the foil loosely into a parcel around the fish. Oven cook at 180 degrees (fan) for around 18 minutes. Make up the chicken stock as per the instructions on the Oxo packet and saute the chopped onion, greens, and garlic in a pan, with the stock until cooked. Keep adding a little water if necessary. 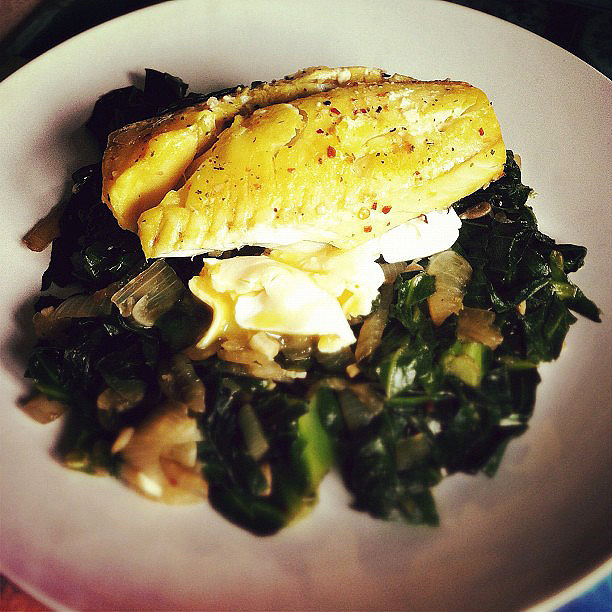 Poach your egg in a pan of boiling water and serve with the fish on a bed of the greens. Sprinkle with sunflower seeds. Spray your non-stick frying pan with cooking oil spray (around 10 sprays should do) and on a low/medium heat, fry off the chicken and garlic. You may need to add the occasional splash of water to stop the chicken from sticking. Add the mushrooms and pesto, reduce the heat and cook until the mushrooms are softened. Meanwhile, make the (very simple) salad dressing by combining the olive oil and white wine vinegar. Serve with a garnish of sprinkled pine nuts. Mmm these pics make me wish that I still ate meat. You’ve done a great job, both look really nice and not boring at all. I adore anything with spring greens! 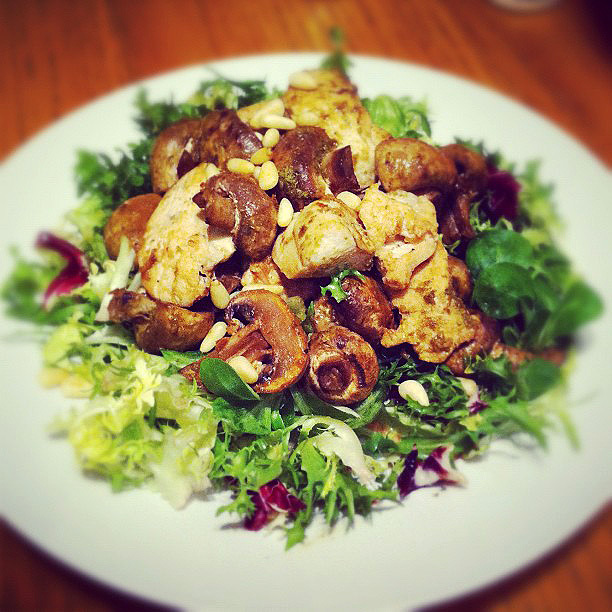 That chicken and mushroom salad looks AMAZING. I have been on a mission with healthy meals recently. I find that putting asparagus on the griddle (no oil needed at all) with some salt and pepper is really delicious and healthy. Also, baking large mushrooms brushed with a small amount of oil – so as to use the smallest amount of oil possible – is delish. My goddaughter told me a good one – finely shred cabbage and stir-fry it with lots of salt and pepper, serve with an egg: she cracks hers into the pan with the crispy stir fried cabbage to make it kind of foo-yung but I think I’ll go with a poached one. Allegedly this tastes like that delish crispy seaweed you get in Chinese restaurants. Going to have to try it.